Says daughter Pia Hinckle: "He had a great, great time, and no regrets." From 1964 to 1969, Warren Hinckle was the editor of Ramparts magazine. He then launched his own publication, Scanlan’s Monthly, which famously sent Hunter S. Thompson to the Kentucky Derby. After that enterprise’s short-lived run, he became a columnist for the San Francisco Chronicle, Examiner and Independent. “Warren was the godfather of California — and you could say, national —progressive journalism,” said David Talbot, whose book Season of the Witch details the tumultuous history of San Francisco from the 1960s to the early ’80s. “As a newsman, he just loved the ’60s as a story, with all its weirdness, from the Black Panthers to hippies in the Haight to the Kennedy assassination. No publication caught it better than Ramparts — it led directly to publications like Rolling Stone, Mother Jones and Salon,” the web magazine Talbot co-founded in 1995. 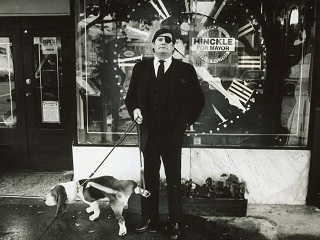 Herb Caen was the greatest San Francisco columnist over the past fifty years, and Warren Hinckle might well deserve to be viewed as the city’s most influential reporter…. No San Francisco newspaper reporter over the past fifty years catalyzed San Francisco readers like Warren Hinckle. He was our version of the legendary San Francisco muckraker Fremont Older, and his flamboyance matched the spirit of former Chronicle editor Scott Newhall. Warren Hinckle would have been right at home in the dizzying world of deadline journalism portrayed in His Girl Friday or The Front Page. Up unto his death, the journalist, who also published intermittently from 1992 to 2012 election newspaper The Argonaut, was working on the biography Who Killed Hunter S. Thompson? The book will be released posthumously.